Ari Virtanen is a native Finn and has a degree both in engineering (B.Sc. Eng.) and business administration (MBA), with university level post graduate studies in organisational psychology, business law and administrative sciences. He has over 30 years of practical experience in leadership and in strategic and operative management positions in the international market place. He has lived over 14 years on four continents, in six countries and has developed customer or supplier relations in over 70 countries. 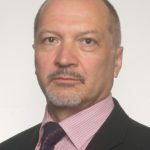 Prior to establishing Solidior Ltd. he worked over 20 years in MNE size enterprises in various positions, such as managing director, manager of procurement and logistics, sales and marketing manager and contractual maintenance manager. For the last 10 years, he has managed SME size companies with an international business scope. Ari Virtanen joined CBA as associated M&A Adviser in December 2015.